The Department for Transport (DfT) has invited the council to bid for a grant of up to £1m for a package of measures to improve safety on a 12-mile stretch of the A285 between Petworth and Chichester. Roads minister Andrew Jones appears to have pre-approved the grant, although the council has not yet decided what the funds would be spent on. 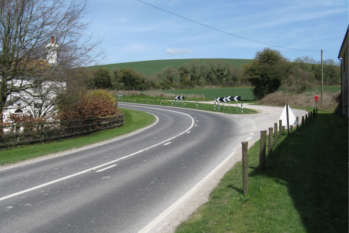 In a report this published this week, the Road Safety Foundation said the a rural, winding road is ‘England’s most persistent high risk road’. It is popular with motorcyclists, who account for 39% of crashes causing death or serious injury. West Sussex said the data used in the report is 18 months out of date and ‘does not take into account the improvements the County Council has made since then’. It said the latest figures show recent improvements to the A285 are having a positive impact. Between 2013 and 2015 the number of fatal or serious accidents per year dropped from 10 to one – although in 2016 this figure rose to six. Bob Lanzer, cabinet member for highways and transport, said: ‘The A285 has been a priority for us for many years and we have invested in a high number of safety schemes along the route in question. ‘These all help or warn drivers when they approach the more dangerous locations on that stretch of road, and have made a difference in the number of accidents reported. The DfT did not respond to a request from Transport Network to explain the process by which Mr Jones had directed the £1m to be awarded.